Black-billed Magpie chicks are leaving their nests and cackling up a storm in just about all the birding locations I have been visiting in the last couple of weeks. Growing up here in Idaho, we all thought of them as disgusting carrion birds as they were often seen eating roadkill on the side of the highway. I have since come to enjoy their beauty. The photo above catches a little bit of blue reflecting of the black wings. Check out that blue eye! It must be that juveniles have the blue eyes as photos of mature magpies all seem to have dark eyes. A recent post from the Birdchick about her visit to Utah and seeing magpies also reminded me that even Black-billed Magpies are special birds. Magpie nests are also very important for owls. I have Great Horned Owls and Long-eared Owls using old Magpie nests right here in my community. Their large twiggy nests are pretty cool too. Good ones will have a stick roof over the top of them for a little extra protection from the elements and predators. 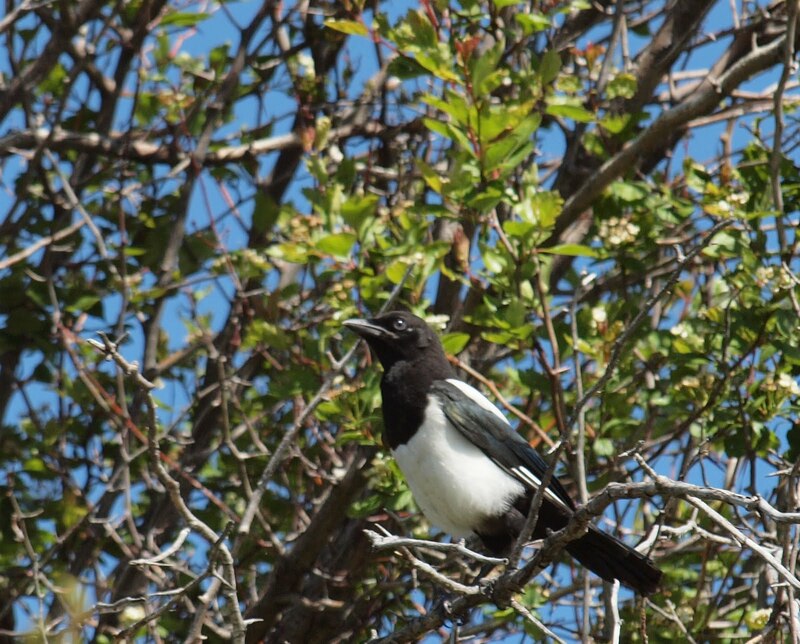 Black-billed Magpies were once severely persecuted by game-bird hunters and ranchers in Idaho. Apparently they were accused of destroying upland game bird nests and of keeping the wounds on cattle open as they nipped at the exposed flesh, which may have some truth to it. While doing some history research at the Boise Public Library, I came across a 1927 article in the Idaho Daily Statesman. It was announcing the winners of a Magpie killing contest in a nearby town along the Snake River. The object was to kill as many magpies in one day as possible and to prove it by bringing in the heads. Magpie eggs removed from the nest even counted as a kill. I was dismayed that the winner had “taken” over 3400 magpies with the runners-up taking 2500+ birds each. The winners were awarded of course with nifty new rifles with which to kill more magpies. It amazes me that mankind didn't exterminate magpies 100 years ago. Must be hardy critters..and smart too. I'm glad they are still around. Awesome shot of the Magpie. They are neat looking birds, I remember seeing my first one In Yellowstone. I a big fan of magpies and corvids in general. Amazing birds that don't get the level of admiration they deserve, especially since they are relatively common. What an amazingly resourceful and enduring bird! Evening Grosbeak - love the Unibrow! Idaho Camera Birding Photo Competition - Results!